When people think of anxiety it is often the psychological symptoms that tend to first come to mind, but there are also some very real physical symptoms linked to anxiety that are worth being aware of. When we experience anxiety our body experiences a chain of events that is designed to help us when we are in situations of real danger: this is known as the ‘flight of fight’ response. As a result of this response, we can experience a range of physical symptoms that we may not initially realise are linked to our anxiety. Whether it’s one, two or a wide range of the above symptoms that you experience when you are anxious, it can be useful to acknowledge that these are linked to your anxiety. 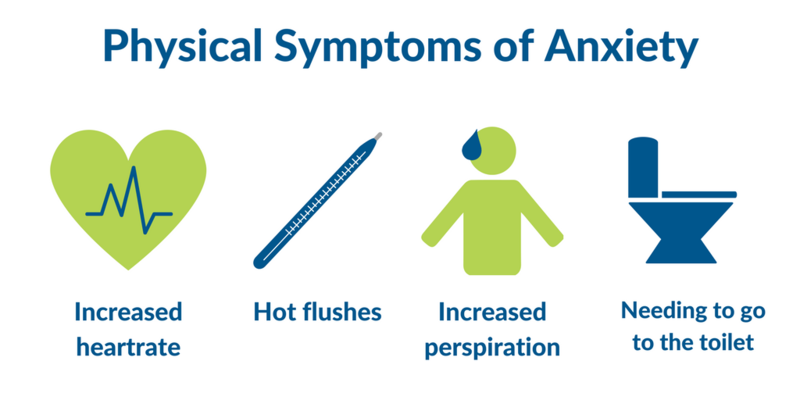 These types of symptoms are very common and while they can certainly be unpleasant, they are completely normal during periods of anxiety and stress. Also, don’t forget that everyone experiences anxiety in different ways and so you may experience some symptoms that are not listed above. By recognising that your symptoms are a result of feelings of anxiety, it can be a really valuable step in helping you begin to be able to manage them. When we experience physical symptoms without being able to attribute them to anything, this can actually lead to increasing levels of anxiety as we can become concerned that these are a sign of a serious medical condition, rather than linked to our mental well-being. So, next time you are experiencing anxiety or panic and find yourself with any of the above physical symptoms, reassure yourself that these are completely normal and experienced by many others.